When the bomber jacket trend made it's first appearance I wasn't too keen on it but of course, being a fashion blogger, I feel compelled to try trends even if I wouldn't usually which isn't at all a bad thing in my opinion! Thanks to blogging I've tried so many trends I would usually steer clear of and funnily enough, I've really come to love some of those - the bomber jacket being one of them. I previously styled a khaki green one which I didn't love but I think it was down to the material and overall feel of it (no idea if that makes any sense) but it was quite tough looking and a bit boyish which isn't my usual style choice. 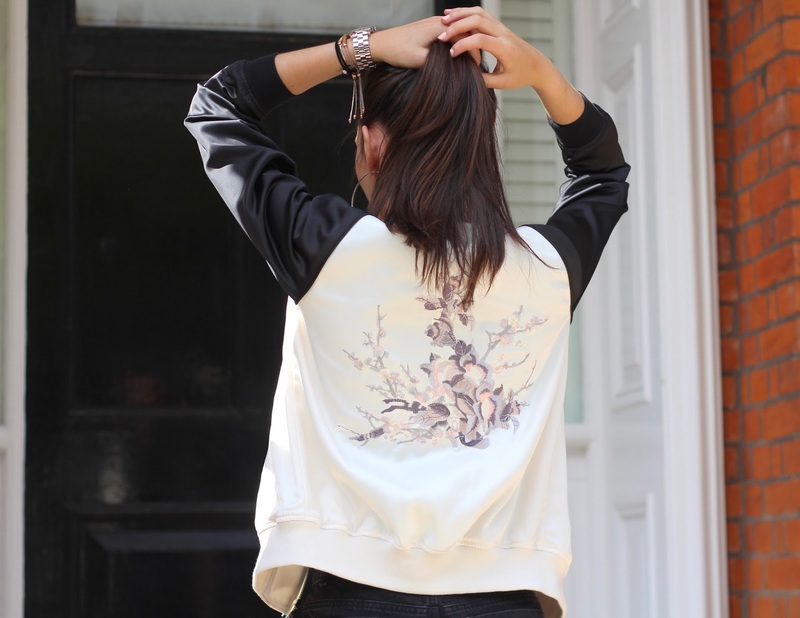 Then, on a recent shopping trip in New Look I spotted this silk bomber jacket which I instantly fell for and if that wasn't good enough, the embroidered detailing on the back sold it for me. I'm still finding it quite a tricky piece to style, it's off-white with a tinge of pink so it doesn't work too well with white tops; I've only gone as far as styling it with black for now although I think I'll have many more opportunities to style it now that the weather is back to the usual cloudy with a strong chance of rain. A quick mention on these shorts too, they're a purchase from last year which I completely forgot about until a few days ago but they're amazing! I'm planning a video all about my favourite shorts soon so keep an eye out on my channel for that within the next couple of weeks.